Gerda Steiner Designs, LLC: Meeeoooowww! It's Christine here today (from Cards by Christine) - and I have the honour of having been asked to Guest Design here at Gerda Steiner! 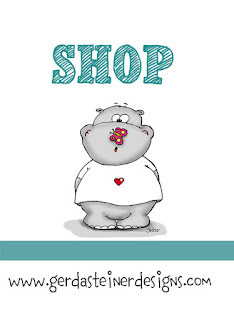 Of course, I quickly agreed - and so today I'm sharing my first make. 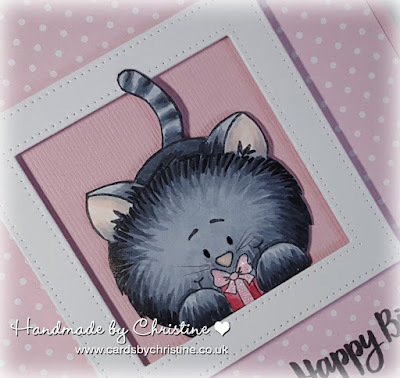 I chose to use an image from All Cats - which is a fab set of three lovely fur babies, along with sentiments to match. I firstly coloured the image with my Copics - and tried to give the look of fur by using lots of short strokes in different shades of Cool Grey. 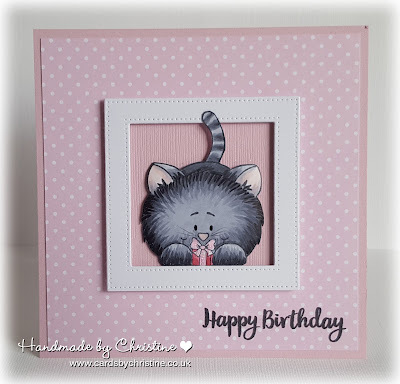 Then I fussy cut the image, and adhered it to the plain pink square using 3D foam pads, after previously shaping the image slightly with a large embossing ball. I used a square stitched frame so the the kitty could be peeking out with her gift.... and her tail could be outside of the frame. Hope you like what I did... I'll be back with another make soon. I'm 50-something(! ), and have two grown up daughters who I love very much and am exceptionally proud of! I've recently moved up from the Isle of Wight to wonderful Yorkshire - which I absolutely love. Where else can you get such a warm welcome from lovely people? And so many wonderful places to visit and explore? Very cute and well done. Love the colors and your coloring. Thumbs up!